I Went VEGAN for a Week! Sooo this post needs a little bit of background. Back in April, I was a die-hard meat-eater. Like, COMMITTED. I couldn’t imagine my life without tacos, hamburgers, and, ahem, Chickfila chicken nuggets, and frankly – I didn’t want to. I considered myself to be a pretty healthy eater, but you’d have to tie me down and handcuff me before I’d ever willingly eat a meat-free diet. Fast forward six months, and I’m now currently striving to eat completely plant-based – stuffing all the spinach, arugula, chia seeds, chickpeas and goji berries I can find into my mouth. I NEVER in a million years thought I would say those words! What on Earth happened, may you ask?! Fast forward to September – I had been eating a mainly vegetarian diet (although not vegan) and feeling great, but was finding it time-consuming and a little frustrating to come up with interesting meals. A friend told me about Sakara Life – a meal-delivery system that is 100% plant-based, organic, and gluten-free. The glorious thing is that all of the meals arrive in a cooler-like box (with lots of recyclable freezer packs) and they come ready to eat – no chopping up ingredients or assembling or anything like that! 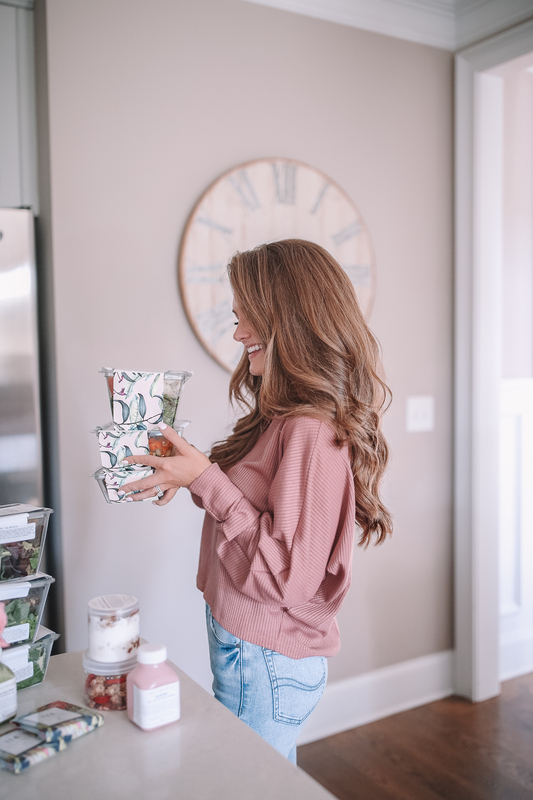 All of the meals are nutritionally designed based on the science behind a whole food, plant-based diet to pack in the most nutrients as possible. 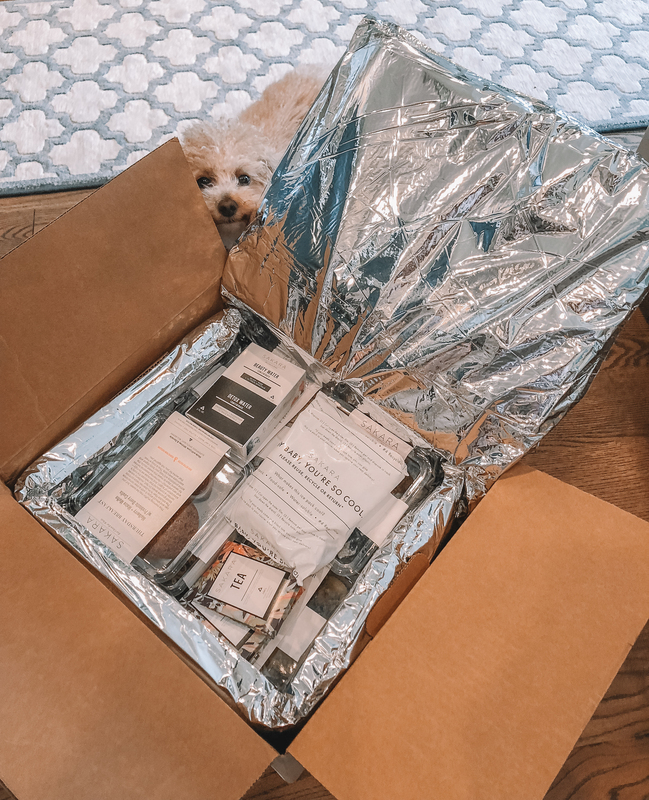 In fact, Sakara Life’s motto is “count nutrients, not calories.” After reading reviews where women raved about how good they feel on the plan and experienced less bloating and clearer skin, I was dying to try it out for myself. At exactly 12 pm, my doorbell rings with my Sakara Life delivery. I chose the 3-day meal plan, which provides three full days of meals, starting from Tuesday dinner through Friday lunch. The meal plan is expensive, so that’s partly why I opted for only three days! I immediately unpack everything, dispose of the environmentally-friendly freezer packs and stack up all of the containers in my fridge. Since it was my first delivery, they threw in some cute little goodies, including a tote bag and some probiotic “chocolates.” There’s also a bunch of Sakara Detox Tea bags (I’m supposed to drink the tea in-between meals), along with Beauty Water Concentrate to put in your water in the morning and Detox Water Concentrate to put in your water at night. My first dinner is labeled with “Tuesday Dinner” so I know exactly what to eat – and it’s a “Summer Sun Salad.” I’m so hungry that I manage to take a picture of the packaging, but not what the actual meal looks like. I dig in and eat fast – it’s surprisingly delicious, as in, one of the best salads I’ve ever had in my life! 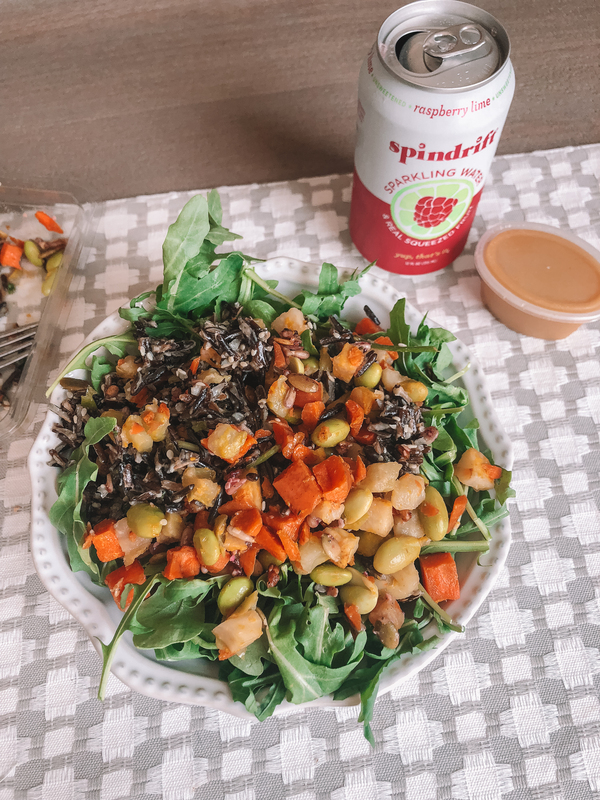 The salad contains a killer dressing, zucchini noodles, hemp seeds, a TON of greens, and a bunch of other toppings that all somehow taste amazing together. After dinner, I have a piece of the probiotic chocolate (which doesn’t really taste like chocolate, btw) but it squashes my typical craving for dessert. About an hour before bed, I pour myself a large glass of water and add in five drops of the Detox Water Concentrate – it contains chlorophyll so it turns my water a tiny bit green, but it doesn’t taste bad. The chlorophyll is supposed to help cleanse your body of toxins and help you sleep better at night. I go to bed feeling content and excited to see how I feel after an entire week of eating clean! I wake up around 7:30 a.m. and head to the kitchen to down a huge glass of Beauty Water. It makes me realize that I NEVER drink water in the mornings – usually only coffee! In fact, I’m so full of water that I don’t even feel like making my normal coffee, so I go ahead and start on breakfast. Today’s is a Mulberry + Maize Muffin with a Probiotic Berry Coulis and a side of blueberries. The packaging has a flame symbol on it, which means they recommend heating up the meal. I put my muffin in the oven for around 10 minutes, and then dig in. 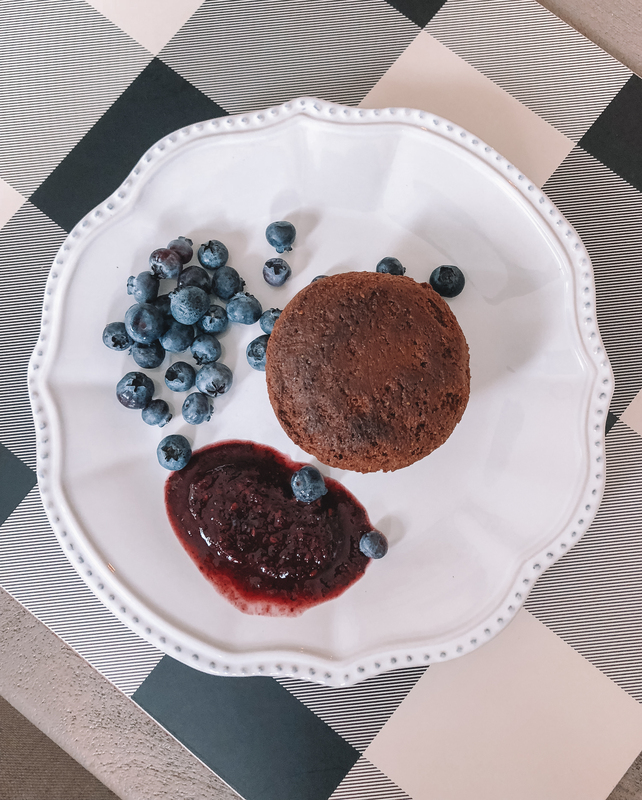 By itself, the muffin is pretty bland tasting, but when it’s dipped in the Probiotic Berry Coulis – OMG IT IS ABSOLUTELY LIFE-CHANGING. I enjoy every single bite. I gobble it up and then head to my 8:30 a.m. Pure Barre class. By the time lunch rolls around, I almost forget that I have a Sakara Life meal waiting for me in the fridge. It’s reassuring to remember that my lunch is already planned out and prepared for me, and I don’t have to scramble to put something together (like normal). Lunch is a Wild Rice + Miso Salad, and it’s reallllly good (although not as good as the salad from last night). Again, the dressing is amazing and makes the greens taste so much better. Also, that’s another thing I’m starting to realize about Sakara Life: each meal contains a TON of greens. And when I say a lot, I mean a ton! In the afternoon, I sip a detox tea and it’s pretty good, although there’s not much of a taste. I’m also starting to feel the effects of skipping my morning coffee – I’m so sleepy that I can barely stay awake! It’s already 4 p.m., though, so having any caffeine is out of the question, or I won’t be able to fall asleep tonight. I’m also feeling a little hungry, so I nibble on some raw almonds to stave off hunger before dinnertime. It’s finally dinner, and tonight’s meal is a Kimchi + Buckwheat Soba Bowl with Sweet Sesame Bok Choy. Although they’ve tried to disguise it as something else, I realize that it’s pretty much just another salad, with the soba noodles on top and a ton of greens packed into the bottom of the container. I can’t complain though – it’s delicious, especially the dressing, which is made with truffle oil and hemp seeds. I eat it happily knowing that it not only tastes good, but is packed with nutrients. A few hours later, I drink my Detox Water and then head to bed, falling into a deep sleep almost right away. I wake up feeling particularly rested after an incredible night of sleep and head to the kitchen. 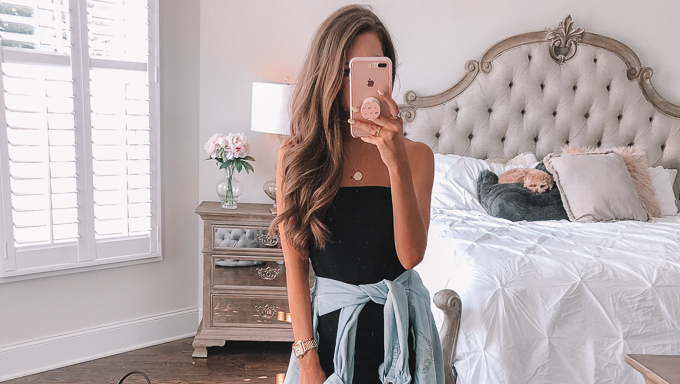 I drink my Beauty Water right away, then make a beeline for my espresso machine – after how tired I was yesterday, I desperately need caffeine today! 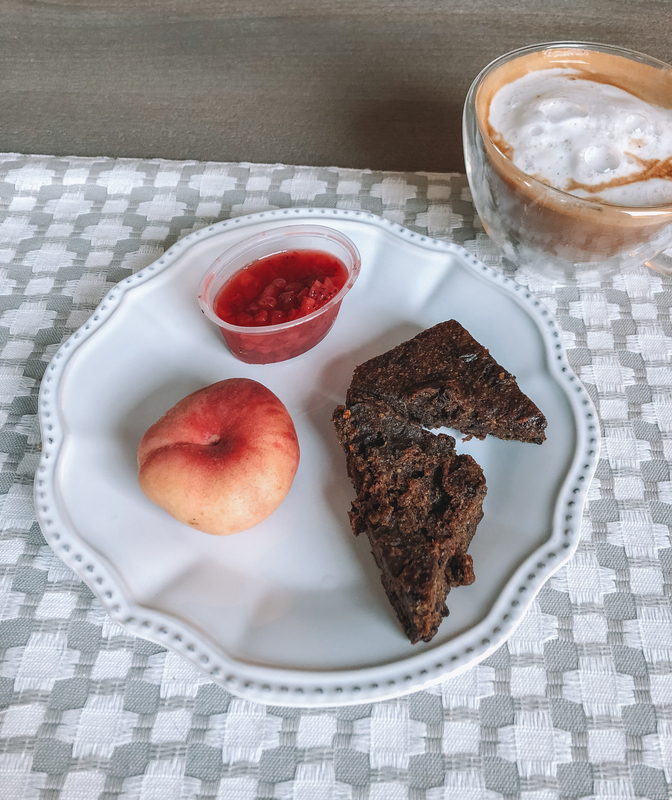 Today’s breakfast is Banana Protein Bread with Ruby Red Berries and a small peach. I heat up the protein bread, and not surprisingly, the “Ruby Red Berries” spread (macerated strawberries) that it comes with is DELICIOUS and makes the whole meal worth it. The banana protein bread seems to melt in my mouth and the macerated strawberries give it a sweet, tangy taste. I even contemplate trying to make my own banana protein bread when the program is finished. I’m hoping that tonight’s dinner makes up for the less-than-lovely lunch. It’s a Thai Burger with Rainbow Slaw + Root Fries. I get incredibly excited when I read that… a BURGER!! What a treat – and it really is – the “burger” is delicious, although I realize halfway through my meal that they’ve tricked me yet again, since this meal could technically count as a salad, too. I end up crumbling the burger over the greens and spreading the thai dressing over it all. The dressing is delicious and so are the “root fries,” which taste just like sweet potato fries. For all the salad I’ve been eating lately, I’m surprisingly full. Like clockwork, a couple of hours later, I drink my Detox Water and then head to bed. Is it just my imagination or am I starting to sleep better?? When I wake up this morning, I immediately notice that I feel lighter and more energized, and I haven’t even had my Beauty Water yet. I also realize with a bit of sadness that it’s the last day of my Sakara Life trial. 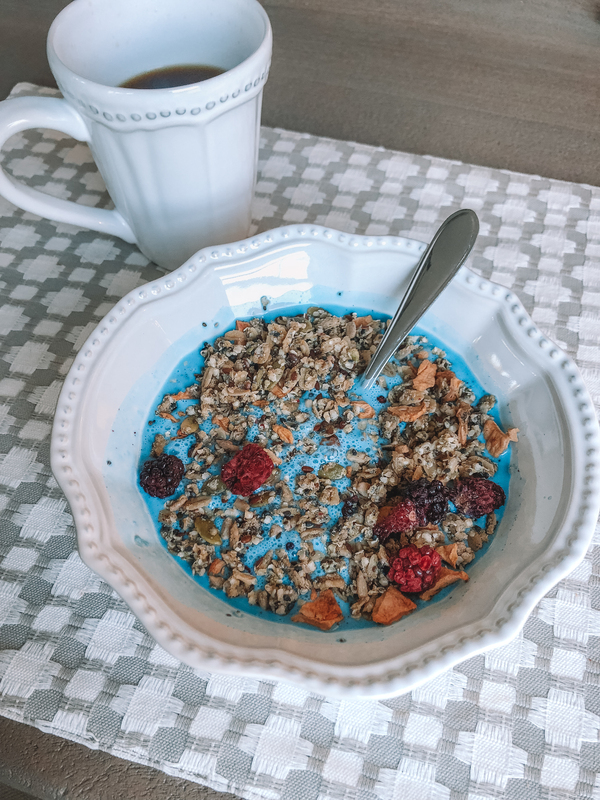 I make my breakfast for the morning, a huge bowl of Superfood Granola with Blue Majik Mylk, a dairy-free milk made with spirulina. I pour it into a bowl just like cereal, and give some serious side-eye to this big bowl of blue milk. I’m a little hesitant to dig in (it looks so crazy, after all!)…. but somehow, this breakfast is even BETTER that the other two (and I loved the others!!). 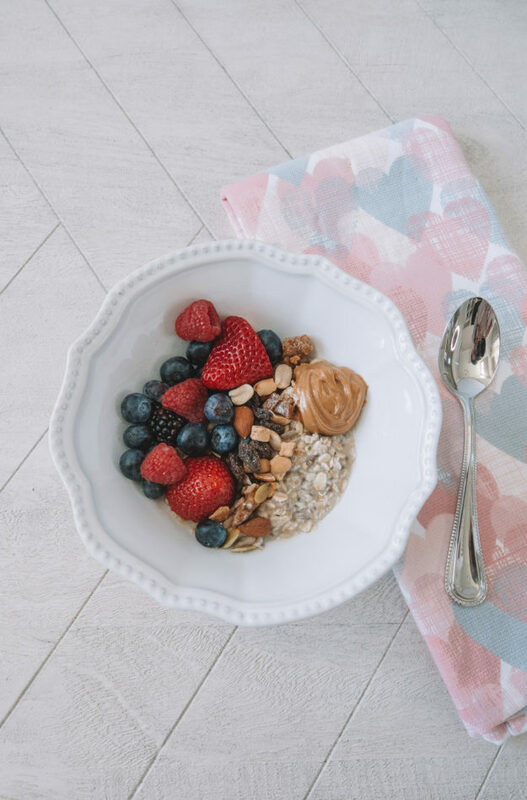 It tastes so good that when I finish eating the granola, I bring the bowl to my mouth and tip it back in order to drink every last drop of the blue “mylk.” I really like that Sakara Life has forced me to try new, healthy foods – and I’ve actually liked them! It’s not for everybody. Ha! I love eating vegetables, and since I’ve been eating a vegetarian diet for a few months now, a week of plant-based healthy eating was not a huge adjustment for me. I loved how creative the Sakara Life team gets with each meal, but I also enjoy the taste of “healthy” foods. For someone who eats meat every day or doesn’t really like the taste of vegetables, it would probably be a bit of a shock. It would be a great way to “reset” or detox your body for a week. The Sakara Life program also made me realize several things about myself: First, I don’t drink nearly enough water! Drinking one large glass in the morning, one hot tea after breakfast, one hot tea after lunch, and another large glass at night was really out of the norm for me and made me realize how little water I actually drink. It’s something I need to change about my daily routine. Secondly, I realized that it’s crazy how much time I usually spend thinking about food. 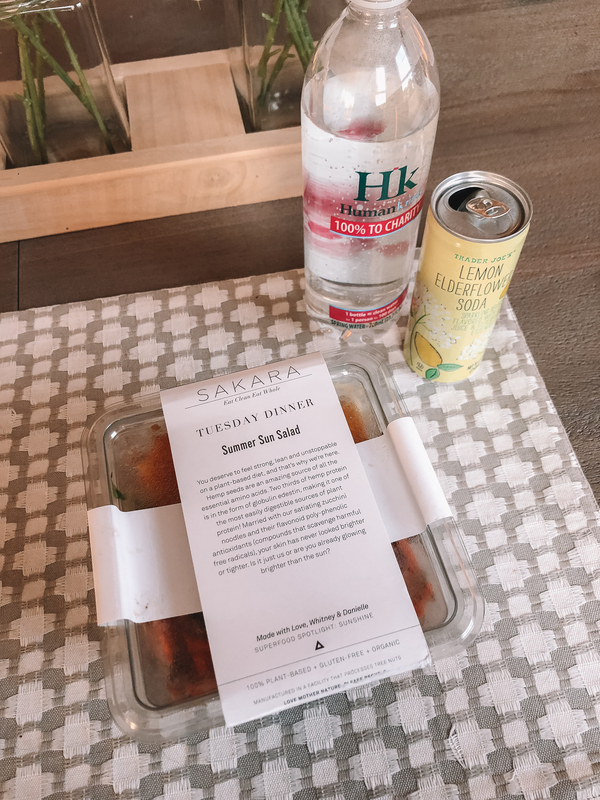 I didn’t even realize it until the week I tried Sakara Life, but in a normal week, so much of my brain’s energy is spent thinking about food. I typically have thoughts running in my head all day about what I should eat for lunch or what I should make for dinner, if we have the ingredients already in our pantry or if I need to stop by the grocery store, how healthy is this dish, how unhealthy is this dish, etc. Sakara Life eliminated ALL of that excess thinking. I didn’t worry about what I was going to eat for my next meal, if it was going to be nutritious, or whether or not I had the ingredients already at my house. In fact, it freed up brain space to think about other things, and I even felt like I could be more present with my husband and more creative at my job. Another side effect of being vegan for a week? Maybe three days is too short of a time to tell, but I SWEAR I felt less bloated and my skin looked clearer by the end of the week. (It could have been a result of all of that water, too!) I just felt, overall, so much lighter and brighter. My energy levels were up, my brain was focused, and I was falling into a deep sleep at night and waking up in the morning feeling rested. I would eat mushroom pasta ALL day if I could feel this good all the time! Just a disclaimer, I feel a little cautious writing posts on health and nutrition because I’m not a doctor and obviously there are lots of people out there with different opinions and lifestyles from me! So don’t take what I’m saying at face value…go and do your own research! You have to do what’s right for you. Whew okay sorry for the long post you guys! 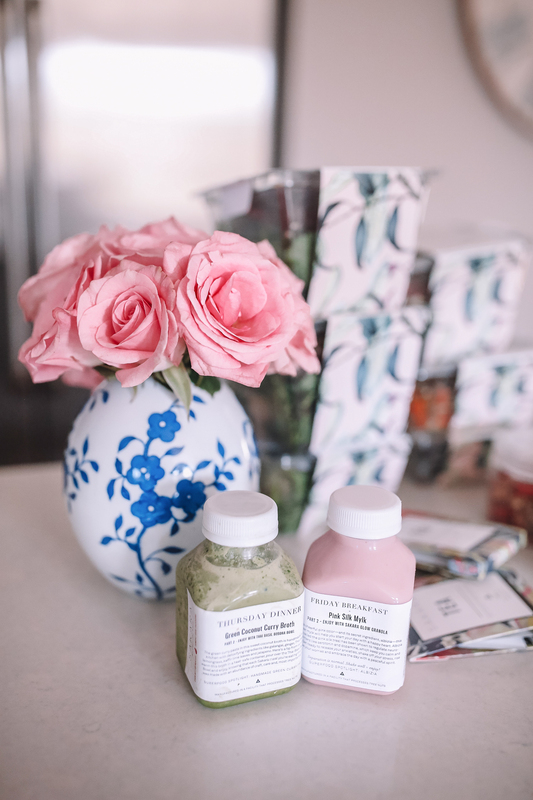 I’d love to know, would you try out Sakara Life, or if you have, what were your thoughts!? xox. 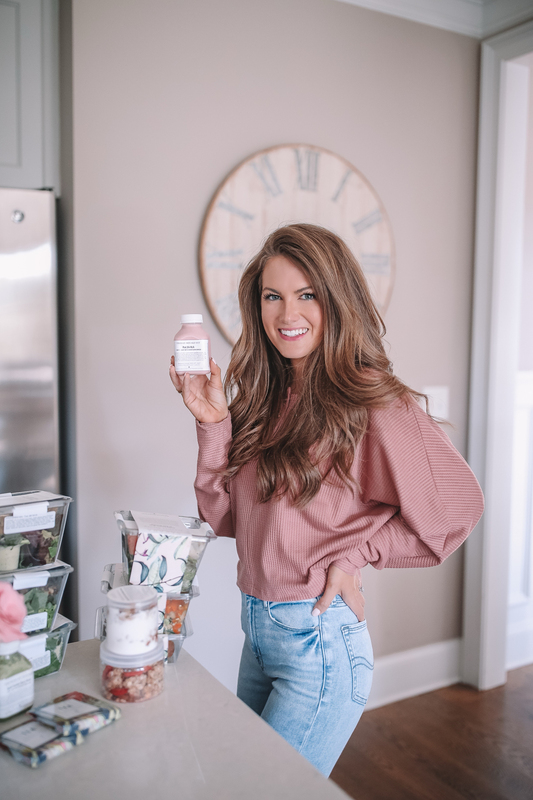 UPDATE: Like I said, this post was totally unsponsored, but Sakara Life did reach out to me after this post went live to see if I wanted my own coupon code! You can use code REF_ SCP15 to receive 15% off your first order, meal plan or anything on their site. You can check out their site here. I loved this post! 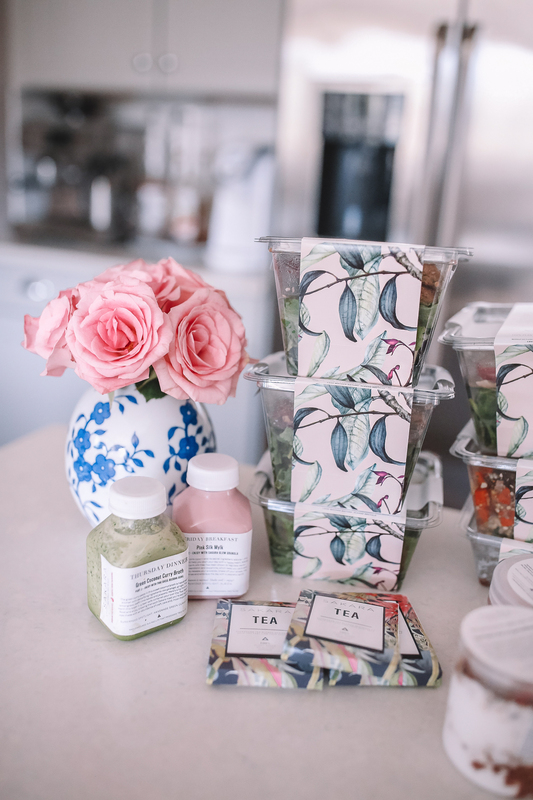 I listened to a podcast interviewing the owners of Sakara Life and found it so interesting. Thanks for sharing your honest thoughts!! http://trendkeeper.me .. affordable special event dresses! This honestly sounds amazing!! I’ve been a vegetarian for 10 years but haven’t been able to try vegan yet – I love cheese so much! Ahhh. I’d love to try this meal plan though; especially the “beauty” water! I’m intrigued. I appreciated your honesty with this post! I’ve been cautious of trying Sakara because all I’ve read are sponsored posts, but this was a breath of fresh air! I’m really impressed with how you were able to describe your experience but not come off as if you have all the answers, hope that makes sense haha. Looking forward to reading more from you!!! My journey started with the book, “Why We Love Dogs, Eat Pigs, and Wear Cows” by Melanie Joy. I went from being a die hard meat eater to an ethical vegetarian overnight. Then for six years my thoughts vacillated between “eating dairy/eggs still hurts animals” and “but cheese is so good” until in early 2016 I read “How Not to Die” and by April 2016 finally committed to plant-based veganism and have never looked back. Whether you’re ready to fully commit or not it’s still great that you’re exploring it as an option. Check out Lighter.world. It’s a vegan meal plan website that provides you with nine meal options per day (3 breakfasts, 3 lunch, 3 dinner and you choose which ones you want to eat for the day). They show a weeks worth of days in advance you can plan ahead and stock up on groceries. Not every recipe is healthy but most are and you can customize it to weed out recipes containing processed foods…and even mushrooms! Also, they have industry leaders (including Dr. Greger) that you can “follow” which means your recipe options include your chosen person’s top recommendations and ideal meal plans. And at $8.25 – $14/month it’s much cheaper and more flexible than the meal delivery services. I love eating this way for so many reasons! People make fun of my morning green juice habit and tell me I’m addicted to health food…I tell them I’m not addicted to health food, I’m addicted to the way eating healthy foods makes me feel! I have been veggie for around a year now and too became Vegan recently after reading that book!! How amazing is it!? 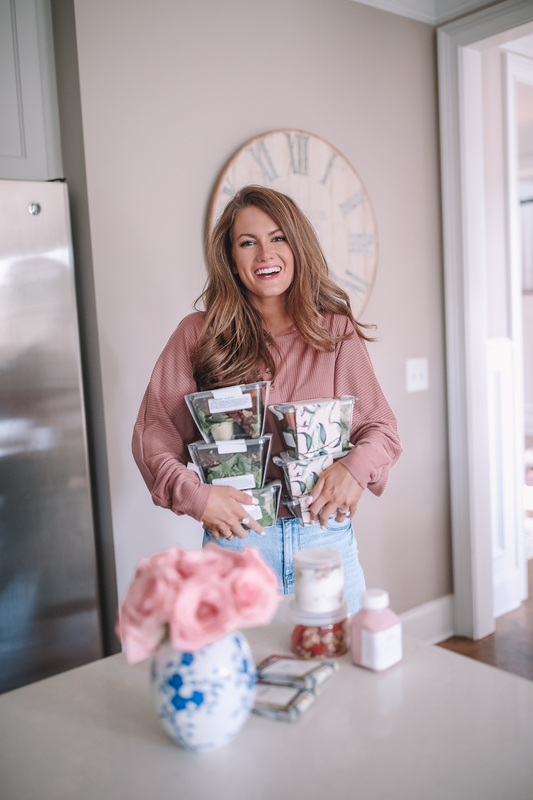 I loved seeing your honest thoughts about Sakara Life, Caitlin! As a health enthusiast, I found your post to be VERY interesting and liked your diary-format of how you felt each day. I eat vegetarian during the week myself and have experimented with food and my body before as well. From my personal experience, reducing meat has helped me a ton. When I went back to it, especially red meat, my body ached a bit and I thought I was imagining it, but I wasn’t. After not eating red meat for awhile, it was like my body didn’t want it. I still eat a bit of meat, but not as much as I used to. To me, my body craves foods like kale so the meals you got wouldn’t be a huge adjustment for me. It’d just make my life easier and eating healthier a bit more fun, ha! Thanks so much for sharing your honest review. I appreciate it! I’ve thought about trying out Sakara Life so many times! Being in college and having a super busy schedule usually attributes to me only eating one or two meals a day or eating out a lot, which I don’t prefer. However, I know it is pretty pricey, which is why I’m still hesitant to try. I think your blogpost gave a lot of good information though, and I’m interested to see if there are some similar make-ahead meals I could meal prep for a week full of delicious plant-based foods! Enjoyed this post! I also love your dishes! Where are they from? I absolutely loved this post. We’re vegetarian Monday-Thursday/Friday but I’ll do meat on the weekends. 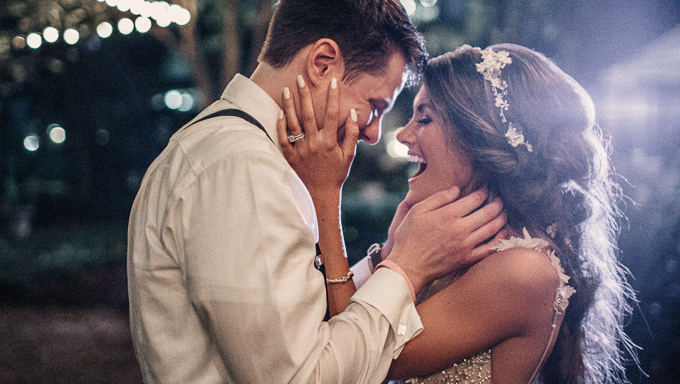 I thought my husband would be the hardest to convince but he was the easiest. Our 14 year old was the hardest – she runs cross country and likes meat after long runs. I lost all of my baby weight in a snap, my skin (and our daughter’s!) stays clear, and I have eliminated those up 3 lbs and down 3lbs weight changes. It’s honestly one of the best things we’ve ever done. Will you please please please link your pink sweater and where you got your buffalo plaid placemats? Thank you!!! (BTW – Kite Hill makes amazing vegan cheeses. They’re at Whole Foods). Just ordered the book! OOPS! I saw you linked the sweater, jeans, etc. I apologize! Really appreciated how you did this in diary format! I have been intruiged by Sakara Life since I heard them on the TSC Podcast – the way they talked about using food to heal their bodies really resonated and was incredibly inspiring. It is wild how much food affects our bodies but I’ve seen it first-hand! Though you do seem to eat really healthy, I feel like you balance that with “normal” and even “unhealthy” foods from time to time (hello Olive Garden lolz) so hearing that you thought these meals were all really delicious is really encouraging! I may just have to give it a try after baby arrives and I go back to work – I’ll probably be in big need of a reset! Also really loved that this was an unsponsored post. By all means I totally trust your sponsored posts as well because I know that you are super choosy about them but this one being just from a regular customer perspective was really great. Thank you so much for sharing! Love this post! Was so informative and even better that it was unsponsored, because it felt more authentic. Happy to read this and will give it a try! I did a vegan week a few weeks back and while I personally don’t think I could give up meat and cheese, it’s helped me to incorporate more meatless and dairy free meals into my diet! Thanks for sharing your experience! I’ve been mostly vegan for 6 years, and I’ve experienced incredible benefits! Another book you might enjoy is The Plant Paradox by Dr. Steven Gundry. I read it recently and it has changed the way I think about healthy eating, and I’m already eating plant-based! That is dedication! I’m not sure I could do an entire week! I can barely do a 2 day juice cleanse lol! Thanks for the read ! I am curious, did your husband do this with you, or did you do separate meals or what? I am interested in going more plant based, but my husband/family are pretty big on meat and I don’t want to force it on them, so I am thinking about doing 2 separate meals. My husband will never give up meat (or so he’s told me, haha) so we make two separate meals! When we cook together, we’ll make meat to add to his portion and I won’t have any of the meat. It works! This is so interesting – thank you for sharing your honest thoughts!! This post was so helpful! I also thought about giving it a try for a week or so but I didn’t have the “courage” yet ahah. I don’t think I could ever do it, but good for you! some of that really looked, except for mushrooms, I hate them too! You should check out Sarahs Day on youtube! Shes not always vegan, but she has some amazing vegan recipes, especially desserts! 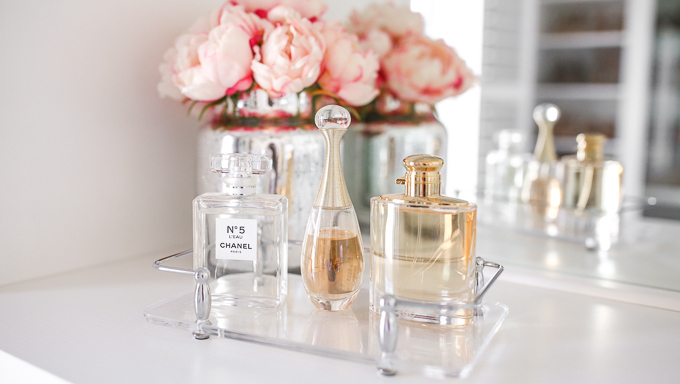 These posts are SO interesting to read and I love hearing your honest opinion! I’d love for you to share more healthy meal ideas and how you’re cutting out meat. Great post! I’ve tried to cut meat myself and even tried go vegan numerous times now. I always resort back to meat or dairy. I just love ice cream! I am definitely going to check out the book you read. I am curious, do you see yourself sticking with not eating meat? How about your husband? Do you see yourself moving to a consistent vegan diet? Love love love this post! I’ve been vegan for a couple years and it is life-changing. It’s just like you said. You feel lighter and more focused. And you feel good about yourself and your body! Go you! Ok I love the beautiful meals but I do have to just give my experience!!! Just be careful all you Vegans! It may be good to go for a bit of time but i tell you from 20 years experience we NEED some animal protein. And I know all the Vegans roll there eyes but I ran into some serious problems that I am still trying to fix. I went to a naturopath DR. and she did all the blood work you can imagine and she knew right away from just my paper work that I was a Vegan. My B’s were so low, my Iron was crazy low and My cholesterol we crazy low. And as women we so need those precious nutrients to have our hormones work correctly. I am now after two years getting things back on track. I don’t love meat but I have upped my healthy fats and am trying to incorporate more into my diet slowly. I wish someone years ago had warned me. What an interesting and great review! I loved seeing all of the different meals you got. They all look and sound very delicious! I’m obsessed with the blue “mylk” lol. What is the beauty water though? Hi Caitlin! As a vegan myself I really appreciate you trying out this lifestyle and sharing your honest review. 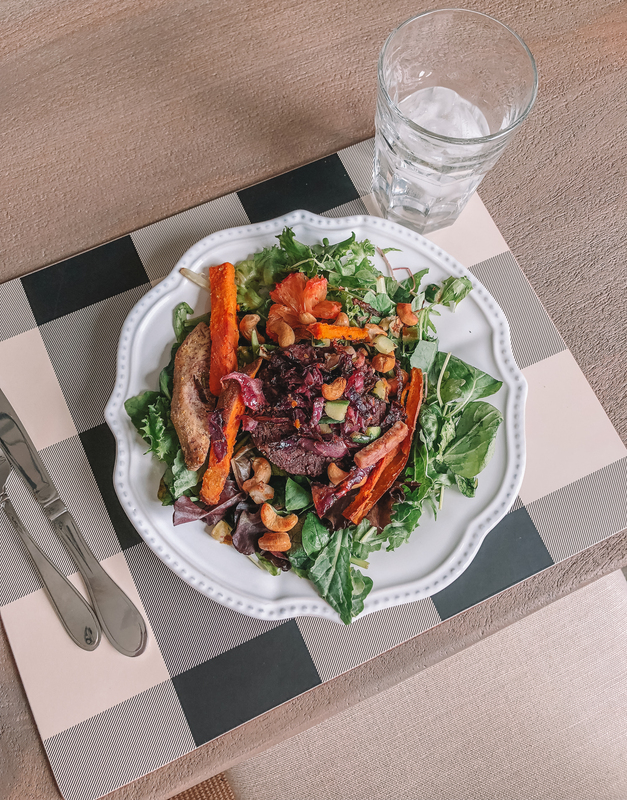 It can be difficult and inconvenient to prep meals especially if your friends and family do not share the same values, meal delivery services is a great way to start! I have never tried meal delivery services (too pricey for me and I love cooking), there are TONS of vegan cookbooks out there – a few favorites of mine are Chloe Flavor and 1000 Vegan Recipes by Robin Roberston. I hope you continue exploring what works for your lifestyle and body! Vegan isn’t for everyone but it sure is worth a try. I thouroughly enjoyed reading this, I think food delivery services are great for people with a really busy lifestyle. And the fact that this one is vegan and super healthy is an added bonus. Really appreciate the healthy eating/lifestyle posts! After reading I decided to try The Daily Harvest smoothies!! I got 3 of my first 6 free. Here is a link for the discount in case anyone on here wants it too! Loved the post! I have been eating mostly plant based as well and love how I feel. Just curious as to the name of the book you read? Love this! I thought I would never go vegan but after watching “What The Health”, my perspective changed. It was a process.. it took a couple months to cut out meat, then a few more to cut out cheese. I took a food sensitivity test and milk/cheese was the highest thing I react to and that was all the info I needed to completely cut it out! If you’re interested in learning more about plant based, I listen to the Exam Room podcast by the Physicians Committee while I’m doing busy work. They break down the science and it’s fun to hear why we should include certain things in our diet! Did you lose weight from going Vegeterian? What are other health benefits did you gain from being vegetarian? Hey Amy, no I haven’t lost weight from going vegetarian! I really recommend that you read the book “How Not To Die” – it is sooo good and can explain the health benefits far better than I can!